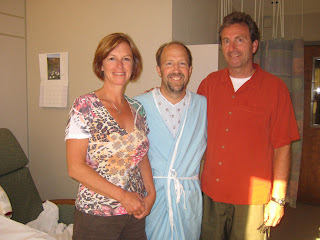 Rick Harder: Last night at the hospital! Moving on Monday. This is Rick's last night at the hospital. He'll move on Monday to the Gift of Life Transplant House. Ed is going back to Seattle, and our sister, Diane, is coming on Monday. Rob Baron is also coming so that he can come in second place playing Scrabble. Lee and Doris are visiting Bend to help take care of Sydney, Jack and Dave while Diane is visiting Rochester. The network of support is getting larger! We have been assured by Lee and Doris that Sam is having a great time with Camille.